Stopping the waves: How can natural barriers like mangroves protect coastal areas? Arriving in the Philippines just two weeks after the super typhoon Haiyan (local name Yolanda) hit the archipelago nation on 8 November 2013, I’ve been following many unfolding debates on disaster recovery and resilience. The Filipino media have been full of post-disaster stories. Among them, I came across an editorial in the Philippine Star on 26 Nov 2013, titled Stopping the Waves, which touched on the role of protecting natural barriers that can guard coastal areas from storm surges. This is just what TVE Asia Pacific’s regional TV series The Greenbelt Reports highlighted. Filmed at 12 locations in four Asian countries (India, Indonesia, Sri Lanka and Thailand) which were hardest hit by the Indian Ocean tsunami of December 2004, the series showcased Nature’s protection against disasters and climate change. It covered three coastal ecosystems or ‘greenbelts’ — coral reefs, mangroves and sand reefs. Reporters and producers from TVE Asia Pacific journalistically investigated the state of greenbelts in South Asia and Southeast Asia by talking to researchers, activists and government officials. They also looked at efforts to balance conservation needs with socio-economic needs of coastal communities. Environmental activist and communicator Piyal Parakrama’s sudden death last week, of a heart attack, jolted Sri Lanka’s closely-knit green community. The activist community may bicker and argue endlessly among themselves, but there is also strong kinship among its cacophonous members. Many of them are still trying to come to terms with the loss. As indeed am I – even if I’m not quite a certified member of the activist community, I consider myself a fellow traveler. I turn to words – either reflective prose or verse – when I want to make sense of something, and over the last weekend I wrote a new essay. It runs into 1,800 words and, as with all my tributes to public figures, this one is also social commentary laced in anecdotal reminiscence. It expands on initial thoughts that first appeared on this blog . 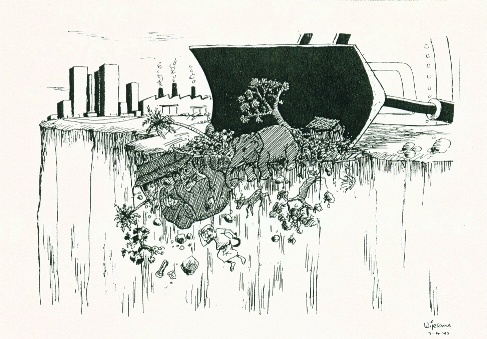 The full essay has just been published by Groundviews, and is titled: Death of a Green Activist: Tribute to Piyal Parakrama (1960 – 2010). During the past three decades, Piyal and fellow activists have taken up the formidable challenges of conserving Sri Lanka’s biodiversity, long under multiple pressures such as growing human numbers, rising human aspirations, and gaps in law enforcement. Adding to the sense of urgency was the 1999 designation of Sri Lanka as one of the world’s biodiversity hotspots, where high levels of endemic species (found nowhere else in the wild) were threatened with extinction. Public and media attention is disproportionately focused on a few charismatic mega-fauna like elephants and leopards; in reality, dozens of other animal and plant species are being edged out. In search of viable solutions for entrenched conservation problems, Piyal collaborated with scientists, educators, journalists and grassroots activists. Some industrialists and investors hated his guts, but he was much sought after by schools, universities and community groups across the country. Concerned researchers and government officials sometimes gave him sensitive information which he could make public in ways they couldn’t. Some eco-protests grew into sustained campaigns. Among them were the call to save the Buona-Vista reef at Rumassala and struggles against large scale sugarcane plantations in Bibile. A current campaign focuses on the Iran-funded Uma Oya multipurpose project, which involves damming a river for irrigation and power generation purposes. While environmentalists ultimately haven’t block development projects, their agitations helped increase environmental and public health safeguards. Occasionally, projects were moved to less damaging locations – as happened in mid 2008, when Sri Lanka’s second international airport was moved away from Weerawila, next to the Bundala National Park. The hard truth, however, is that our green activists have lost more struggles than they have won since the economy was liberalized in 1977. They have not been able to stand up to the all-powerful executive presidency, ruling the country since 1978 — most of that time under Emergency regulations. In that period, we have had ‘green’ and ‘blue’ parties in office, sometimes in coalitions with the ‘reds’. But their environmental record is, at best, patchy. In many cases, local or foreign investors — acting with the backing of local politicians and officials — have bulldozed their way on promises of more jobs and incomes. 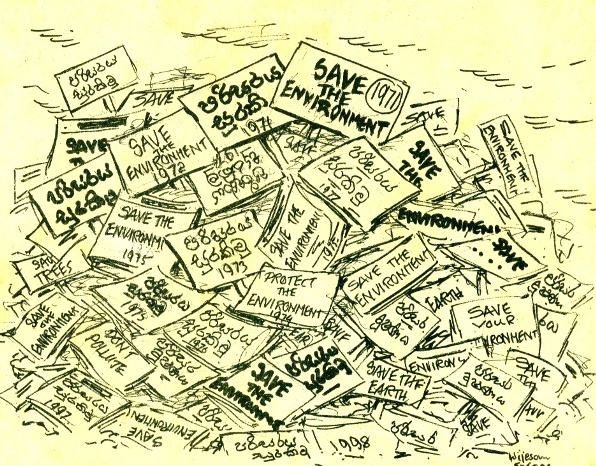 Environmentalists have sometimes been maligned as anti-development or anti-people. In contemporary Sri Lanka, that’s just one step away from being labeled anti-national or anti-government. I had earlier touched on these concerns in a January 2009 blog post titled Vigil for Lasantha: Challenges of keeping the flame alive. If I was harsh in that commentary, I have tried to be more considerate in the latest essay. Read the full essay on Groundviews: Death of a Green Activist: Tribute to Piyal Parakrama (1960 – 2010). Wanted, urgent: Next-Gen Jacque Cousteaus to be our tour guides to Planet Ocean! As my Australian diver friend Valerie used to say, the trouble with many of us land-lubbers is that we have ‘no idea what’s going on in the sea that covers three quarters of our planet’. Yet what we do – and don’t do – affects the fate of the sea and all its creatures and systems. That’s a big problem. Take, for example, roral reefs. Among the most biologically diverse ecosystems on our planet, they are sometimes called rainforests of the sea. And these rich and colourful habitats are now under siege from multiple pressures, ranging from indiscriminate fishing and tourism practices to global warming. Yet, the coral reefs haven’t attracted the same kind of public concern and outcry as has the destruction of tropical rainforests. How come? Is this a case of out of sight and out of mind for a majority of the world’s land-lubbers? This is what I asked Australian diver Tony Fontes, who has been a diver and dive instructor for 30 years, much of it at the largest reef of all – the Great Barrier Reef off the north-eastern coast of Australia. “It sure is – and ideally, everyone should become a diver, so we can all see and feel the wonders of the reef,” he replied. Tony was engaging journalists at the 7th Greenaccord International Media Forum on the Protection of Nature, held in Viterbo, Italy, from 25 – 29 November 2009. This year’s theme is ‘Climate is changing: stories, facts and people’, and Tony was one of 10 Climate Witnesses who travelled to the central Italian city from far corners of the world to share their stories of ground level changes induced by climate change. Climate Witness is a global programme by WWF International to enable grassroots people to share their story of how climate change affects their lives and what they are doing to maintain a clean and healthy environment. All Climate Witness stories have been authenticated by independent scientists. Tony lives and works in Airlie Beach (Whitsundays) in Queensland, Australia. It’s a small seaside community right in the heart of the Great Barrier Reef. Most of his time is spent underwater on training dives – he has clocked over 10,000 hours of professional diving. He generally dives many of the same sites over and over again. This long and deep immersion in the marine realm gives him uncommon insights into the state of the reef – and it’s not a healthy or pretty picture. Increase in coral bleaching is the most noticeable change. From a rare occurrence in the 1980s, it went on to become a regular summer event by the mid 1990s. The past decade has witnessed the largest coral bleaching events on record. And unlike in the past, these have led to large scale coral death and decay. “Many popular dive sites have lost their lustre due to coral bleaching,” he says, pointing out that the reefs need up to 10 years to fully recover. It’s not just warmer seas that affects the Great Barrier Reef. Occasional outbreaks of crown-of-thorns starfish, marine pests who eat up the healthy reef, add pressure on the reef. In recent years, scientists have identified another threat – sediments, fertilisers and pesticides from agricultural run-off. This was investigated in Sally Ingleton’s 2003 film, Muddy Waters: Life and Death on the Great Barrier Reef. Listening to Tony reminded me of Muddy Waters, which journeys to the sugarcane plantations of northern Queensland and into an underwater world to find out what’s killing the reef and what can be done to save it. I was on the international jury of Japan Wildlife Film Festival 2003 when we voted it for the Best Environment and Conservation Award. “It’s hard to get farmers to change their ways,” says Tony, who works with three local initiatives aimed at reef conservation and related educational outreach. This includes Project AWARE, a non-profit environmental organisation that encourages divers to take action and protect the environment. Tony comes across as a man of few, carefully chosen words. His answers are brief and precise. But his passion for the reef and the ocean is clearly evident. Perhaps we need not only the next generation of Jacques Cousteaus, but also every kind of communicator who can take the marine conservation messages through factual and entertainment media formats. It’s encouraging to note that Finding Nemo, the 2003 Disney-Pixar animation movie set in the Great Barrier Reef, is the highest selling DVD of all time – more than 40 million copies, and counting. News by definition looks for the exception. What goes right, and according to plan, is hardly news. Deviations, aberrations and accidents hit the news. It’s the same with disasters. Reducing a hazard or averting a disaster does not make the news; when that hazard turns into a disaster, that typically tops the news. Yet, as we discussed during a session at the 6th World Conference of Science Journalists held in London from June 30 – July 2, 2009, both aspects are important — and both present many challenges to journalists and the media. The session, titled Covering a disaster from Sichuan to Sri Lanka, saw three science journalists share their own experiences and insights in covering two major disasters in Asia. Richard Stone (Asia News Editor, Science) and Hujun Li (senior science writer with Caijing magazine, China) both spoke about covering the Sichuan earthquake that occurred on 12 May 2008. I spoke on my experiences in covering the Indian Ocean tsunami of 26 December 2004. The session was chaired by the veteran (and affable) British journalist Tim Radford, who has been The Guardian‘s arts editor, literary editor and science editor. I recalled the post-tsunami media coverage in two phases — breaking news phase (first 7 – 10 days) and the aftermath, which lasted for months. When the news broke on a lazy Sunday morning, ‘Tsunami’ was a completely alien term for most media professionals in Sri Lanka. In newspaper offices, as well as radio and TV studios, journalists suddenly had to explain to their audiences what had happened, where and how. This required journalists to quickly educate themselves, and track down geologists and oceanographers to obtain expert interpretation of the unfolding events. We than had to distill it in non-technical terms for our audiences. My involvement in this phase was as a regular ‘TV pundit’ and commentator on live TV broadcasts of MTV Channels, Sri Lanka’s largest and most popular broadcast network. Night after night on live TV, we talked about the basics of tsunami and earthquakes, and summed up the latest information on what had taken place. We also acknowledged the limits of science -– for example, despite advances in science and technology, there still was no way of predicting earthquakes in advance. One question we simply couldn’t answer was frequently raised by thousands of people who lost their loved ones or homes: why did it happen now, here — and to us? Was it an act of God? Was it mass scale karma? As science journalists, we didn’t want to get into these debates — we had to be sensitive when public emotions were running high. There were enough topics during the breaking news phase that had a scientific angle. Clinically cold as it sounded, the mass deaths required the safe, proper and fast burial of bodies with identities established. The survivors had to be provided shelter, food, safe drinking water and counselling. And when rumours were spreading on the possibility of further tsunamis, both officials and public needed credible information from trusted, competent sources. After the breaking news phase passed, we had more time to pursue specific stories and angles related to the tsunami. As an environmentally sensitive journalist, I was naturally interested in how the killer waves had impacted coastal ecosystems. Then I heard some interesting news reports – on how some elements of Nature had buffered certain locations from Nature’s own fury. Within days, such news emerged from almost all Tsunami-affected countries. They talked about how coral reefs, mangroves and sand dunes had helped protect some communities or resorts by acting as ‘natural barriers’ against the Tsunami waves. These had not only saved many lives but, in some cases, also reduced property damage. Scientists already knew about this phenomenon, called the ‘greenbelt effect’. Mangroves, coral reefs and sand dunes may not fully block out tsunamis or cyclones, but they can often reduce their impact. Researching this led to the production of TVE Asia Pacific‘s regional TV series called The Greenbelt Reports, which was filmed at a dozen tsunami impacted locations in South and Southeast Asia. By the time we released the series in December 2006, sufficient time had passed for the affected countries to derive environmental lessons of the tsunami. The other big story I closely followed was on early warnings for rapid on-set disasters like tsunamis. Some believed that the tsunami caught Indian Ocean rim countries entirely by surprise, but that wasn’t quite true. While the countries of South and Southeast Asia were largely unprepared to act on the tsunami, the Pacific Tsunami Warning Centre (PTWC) in Hawaii, who had detected the extraordinary seismic activity, did issued a tsunami warning one hour after the undersea quake off western Sumatra. This was received at Sri Lanka’s government-run seismological centre in good time, but went unheeded: no one reacted with the swiftness such information warranted. Had a local warning been issued, timely coastal evacuation could have saved thousands. Part of my sustained coverage focused on logistical, technological and socio-cultural challenges in delivering timely, credible and effective early warnings to communities at risk. I did this by writing opinion essays on SciDev.Net and elsewhere, partnering in the HazInfo action research project in Sri Lanka, and leading the Communicating Disasters Asian regional project. A lasting outcome is the multi-author book on Communicating Disasters that I co-edited in December 2007. All this shows the many and varied science or development stories that journalists can find in the aftermath of disasters. Some of these are obvious and widely covered. Others need to be unearthed and researched involving months of hard work and considerable resources. Revisiting the scenes of disasters, and talking to the affected people weeks or months after the event, often brings up new dimensions and insights. My own advice to science journalists was that they should leave the strictly political stories to general news reporters, and instead concentrate on the more technical or less self-evident facets in a disaster. During discussion, senior journalist Daniel Nelson suggested that all disaster stories are inherently political as they deal with social disparities and inequalities. I fully agreed that a strict separation of such social issues and science stories wasn’t possible or desirable. However, science journalists are well equipped to sniff out stories that aren’t obviously covered by all members of the media pack that descends on Ground Zero. Someone needs to go beyond body counts and aid appeals to ask the hard questions. Another question we were asked was how journalists can deal with emotions when they are surrounded by so much death and destruction in disaster scenes. Reference was made to trauma that some reporters experience in such situations. Summing up, Tim Radford emphasized the need for the media to take more interest in Disaster Risk Reduction (DRR), which basically means preventing disasters or minimising the effects of disasters. As Tim reminded us, disasters already exact a terrible and enduring toll on the poorest countries. This is set to get worse as human numbers increase and climate change causes extreme weather and creates other adverse impacts. Living with climate change would require sustained investments in DRR at every level. Read Tim Radford on how disasters hit the poor the hardest (The Guardian, 22 May 2009).